I am not an avid gardener, but as a landscape architect I have an appreciation for park design, natural landscapes, and formal gardens, even though my career never came close to that aspect of the profession. One of my closest friends since the seventh grade has lived south of San Francisco for years, where I visit often. Since she knows me quite well, she knew I would be surprised and very pleased to have a private tour of this special place by one of her closest friends, a former docent at Filoli Gardens. Set against the dramatic backdrop of the northern Santa Cruz mountains in Woodside, California, Filoli is an excellent example of the Golden Age of American garden design and country house architecture. The gardens were designed and built between 1917 and 1929. 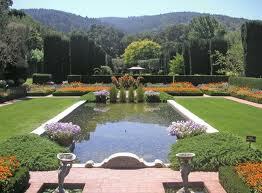 Opened to the public in 1976 as a site of the National Trust for Historic Preservation, Filoli features a 36,000 sq. ft. home and a 16–acre English Renaissance Garden. 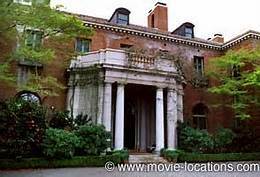 Some of you might recognize the mansion at Filoli as the family estate of the fictional oil tycoon Blake Carrington from the 1980’s television hit “Dynasty.” Filoli’s property includes a 6.8 acre Gentlemen’s Heritage Orchard and a trail system that transverses five different ecosystems for docent–guided nature hikes and visits to the Sally MacBride Nature Center. Filoli is recognized as one of the finest remaining country estates of the early 20th century and is a cherished resource for the community valuing education, volunteerism and diversity. 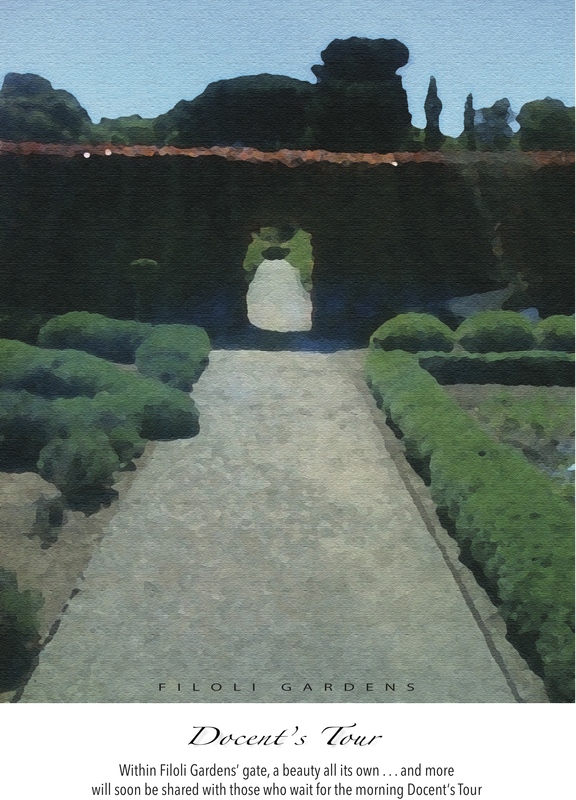 The original art poster and poetic tribute below was created as a special “Thank You” to my new friend for her private docent’s tour of this fantastic garden, and her insight into the history of Filoli. Note: Normally I would fill this page with my own photographs of Filoli. Unfortunately my personal photographs of the tour were lost when my computer crashed, before I understood the meaning of the word backup! For more photographs and information on Filoli Gardens, visit Filoli Gardens.